Born and raised in Tulsa, OK, the youngest of 4 kids. His dad was a rodeo cowboy and rodeo clown, so consequently, all four kids were cowboys, competing in rodeos at an early age. Moe received his nickname at an early age – Mobubali was a character from a Rudyard Kipling novel, who was a red bearded horse trader and since Moe went to endless horse sales, his dad hung the moniker on him which was eventually shortened to Moe. Moe graduated from East Central High School and attended Northeastern State, where he achieved a Bachelor of Arts in Education and a Masters of Teaching degree. He got his first job as an English teacher and asst football coach at Tulsa Central High School. Three years later, he transferred to Tulsa Hale High School in the same position. Eleven years later, he went to Tulsa East Central High School as the head football coach. 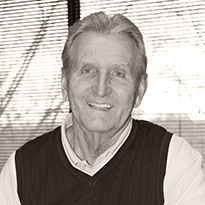 In 1982, Moe left the school business and joined Schiefen & West Ltd., in Tulsa, as a property and casualty insurance agent. In 1986, Moe and Schiefen and West, bought the W.A. Shanks Agency in Owasso and moved Moe and his wife Pat into that office. In 1988, Schiefen and West merged into Rich and Cartmill. Moe than joined Thomason and Moss in Tulsa and operated as J-P Hogan Insurance, an affiliate of Thomason and Moss as a satellite office, the first of its kind in the Tulsa area. In 1999, J-P Hogan Insurance merged with Rich & Cartmill and became J-P Hogan Insurance, an affiliate of Rich & Cartmill, which has been operating since. The Owasso office now had three agents and three 1/2 CSR’s as a property and casualty agency, located at 129th and 76th St No in Owasso. Moe resides in Owasso and is married to Patricia for 50 years as of May 29, 2015. Moe and Pat have one daughter Tara and twin 11 year old grandsons Brayden and Grayson. Hobbies include fishing, traveling and college football – in particular, the Oklahoma Sooners.